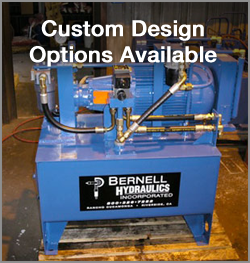 At Bernell Hydraulics, we’ve been in the hydraulic parts and service business since 1977, and we have the skills, knowledge and experience needed to be your premiere source for hydraulic power units Ontario CA. We sell, service, and even fabricate hydraulic power units for all kinds of equipment and applications. Feel free to come visit one of our stores to check out our selection of hydraulic power units and replacement parts. If your hydraulic power unit is acting up, feel free to call us. Our onsite repair service is available 24 hours a day to get you back to work faster. We also offer a special onsite hose repair service as well as maintenance services like fluid flushes and diagnostic tests for your hydraulic power units. You can trust our expert repair technicians to handle any kind of power unit related repair or maintenance with skill and professionalism.